Some people would love to learn to fly but consider it out of reach financially. Many people who start flight training never finish for financial reasons. 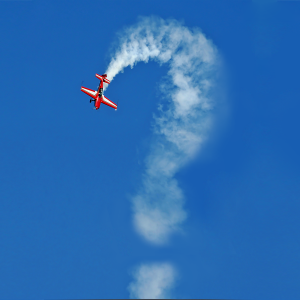 Are you in the process of flight training but stalled out for lack of finances? Perhaps you are successfully on your path to certification but financial assistance would be a big help. 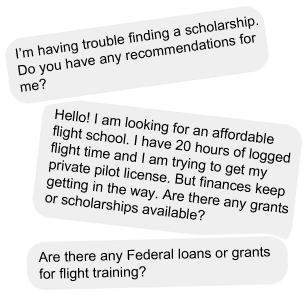 Good news–we’ve compiled a list of scholarships intended to help you further your aviation pursuits. 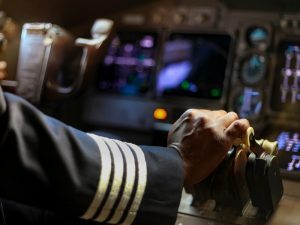 The cost of learning to fly can vary from several thousand dollars to become a Sport Pilot to $60,000 to $100,000 to go from “zero-time” to airline. Finding a scholarship to help cover all or some of your flight training expenses would certainly help. We hope this resource is just what you need to get in the air, no matter what your ultimate goal is. Make sure you review the application deadlines, as some are right around the corner! Experimental Aircraft Association: The EAA offers various flight training scholarship opportunities for pilots in all different stages of proficiency, including several for individuals under 18. These scholarships will reopen March 1, 2019, so check with the EAA soon. Post-secondary scholarships are also offered for students who have graduated high school and want to further their college education by pursuing a career in aviation. Ten post-secondary scholarships are offered by the EAA and applications are due by January 31, 2019. Flying Musicians Association: This scholarship might be music to your ears if you are a high school junior or senior. The FMA accepts nominations from high school music directors recommending students who are enthusiastic about aviation. The FMA partners each scholarship recipient with a local flight school in his or her area. Nominations are due by January 31. American Institute of Aeronautics and Astronautics: Students in science or engineering programs pursuing a career in aerospace can benefit by applying to one of the many scholarships offered by the AIAA each year. Scholarship funding ranges from $500 to $10,000. Applications must be received by January 31. LeRoy W. Homer Jr. Scholarship: This scholarship supports anyone between the ages of 16 and 23 desiring to become a private pilot. Last year, two recipients received $5,000 to pay for flight instruction. Applications are due by January 31. National Business Aviation Association: The NBAA charities award scholarships for careers in aviation, aviation management, and aviation maintenance. Applicants are expected to be currently enrolled in higher-ed aviation related curricula or working professionals looking for career advancement in aviation. Applications are due throughout the year. The next application deadline is February 1, 2019. AOPA Foundation: The Aircraft Owners and Pilots Association (AOPA) awards more than $1 million per year in scholarships for high school students, aspiring pilots, and current pilots. In 2019, the AOPA intends to distribute $10,000 flight training scholarships to 80 high school students, ages 15 to 18, and 20 high school teachers as part of the AOPA You Can Fly program, which was designed to create a more vibrant pilot community. Primary flight training scholarships ranging from $2,500 to $7,500 are available for anyone seeking a private, sport, or recreational pilot certificate. For advanced ratings (instrument, commercial, CFI, CFII, MEI), scholarships range from $3,000 to $10,000. All scholarship applicants must be AOPA members; however, there are free student memberships. Applications must be received before midnight April 2, 2019. Air Traffic Control Association: The ATCA Scholarship Fund awarded 10 scholarships in 2018 totaling $108,000. Scholarships are broken into five categories and offer assistance to pay for tuition, books, or any school-related expenses. There are options for students working toward careers in aviation and ATC employees and their children. Applications are due by June 1, 2019. 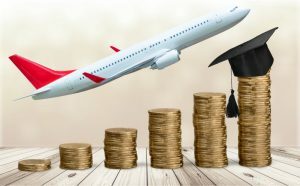 Aviation Distributors and Manufacturers Association: The ADMA offers at least one scholarship for college juniors seeking a professional pilot or aviation management undergraduate degree. Selection is based on merit, letters of recommendation, and an essay. Applications are due by April 1, 2019. Women in Aviation International: In 2019, WAI will distribute $780,000 in scholarships to pilots and aspiring pilots in all stages of life from all over the world. The applications for this year are closed, so stay tuned for the 2020 scholarship application window later this year. Civil Air Patrol: The CAP has a program called CadetInvest that offers flight scholarships and financial assistance to cadets with strong academic achievement. The CAP also has a partnership with the Air Force Academy to offer cadets written endorsements to attend the Academy. Cadet annual membership fees are less than $50. The Ninety-Nines: The slogan of the 99s is “Inspiring Women Pilots Since 1929,” and part of the inspiration is funding scholarships! The 99s have distributed over $11 million through more than 500 Amelia Earhart Memorial Scholarships since the 1940s. Applicants must be a member of the organization and funding covers all levels of flight training. Applications are due January 1, so while the deadline has recently passed, use this time to join a local chapter and apply for next year. Organization of Black Aerospace Professionals: The OBAP has provided more than $4.8 million in scholarships to nearly 500 recipients to promote diversity in aviation careers. Scholarships are awarded in spring and fall for individuals in an aviation program who are interested in pursuing a career in the airlines. Applicants must already have a private pilot certificate and membership in the OBAP is highly encouraged. Spring scholarship applications may be opening soon. Aircraft Electronics Association Educational Foundation: The AEA Educational Foundation will award scholarships to students pursuing a career in avionics or aircraft maintenance, as well as students from AEA member companies. In addition to these aviation organizations, remember to check for local scholarships that might have fewer applicants. A quick Internet search will provide a list of aviation scholarships offered by various organizations’ local chapters. Find scholarships particular to your state or region, high school, type of plane, or even your specific career goal. There are so many options out there! The more specific the criteria you fit, the higher chance you have of being selected. If you are pursuing a career in aviation and are attending an accredited college or university aviation program, you could be eligible for a Federal Pell grant. Also, many banking institutions offer low-interest student loans. Some are designed for career or community colleges that might be well-suited for a professional aviation training program. The University Aviation Association website lists several scholarships on its website with application deadlines in June. Be sure to also check out the academic scholarship information from Boeing on its University Relations web page. There are so many scholarship options out there for anyone pursuing their aviation dreams–we barely scratched the surface. Check each organization for individual scholarships for which you would be a strong candidate. The application process can be lengthy, and it can take a lot of time to read through the specific requirements for each scholarship. Don’t let this deter your from applying. Just like your flight training, make a goal and set specific target dates. Factor in deadlines and make sure those dates are marked on your calendar. Create a timeline and budget for your flight training costs. You may be surprised to find that you can attain your flight training goals simply by setting aside a specific amount of money each month for flight training and cutting back on some of your other monthly expenses. There is no one way to get a pilot’s license, and likewise, there is no one way to pay for it. Talk to others who have done it and get any tips you can!